Recent trends within community policing suggest that the next generation of community policing will be more "knowledge-based", involving a shift toward a problem-oriented and strategic use of information as a basis for management and better use of police resources. Critically evaluates the effectiveness of community policing in seven countries. 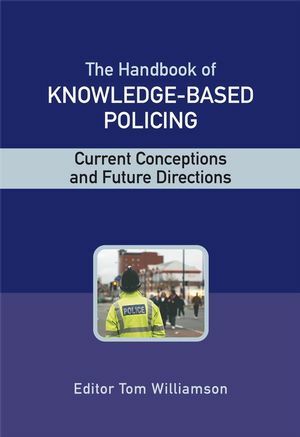 Discusses intelligence-led policing and the emergence of knowledge-based policing. Examines the impact knowledge-based policing will have on policing initiatives. Discussions are set firmly within the context of current debates on risk and the risk society, the broadening or narrowing of the police role, the importance of networks and governance and regulation. This comprehensive collection identifies the factors that will shape the next generation of Community Policing. It is a must-have resource for researchers and students of policing, policy makers and police officers. It will also be of interest to the growing number of people actively involved in crime and disorder partnerships. Tom Williamson (1947-2007) was a Visiting Professor at the Institute of Criminal Justice Studies, University of Portsmouth. He was a chartered forensic psychologists and held a doctorate from the University of Kent for his research into investigative interviewing. He was a former police office who retired from the post of Deputy Chief Constable of the Nottinghamshire Police in 2001 and was previously a Commander at Scotland Yard. Introductory Essay: The Role of Knowledge and Networks in Policing (Jean Paul Brodeur and Benoit Dupont). PART 1: CURRENT CONCEPTIONS OF COMMUNITY POLICING. Introduction to Part 1 (Tom Williamson and Les Johnston). 1. An Overview of Community Policing: Origins, Concepts and Implementation (Wesley Skogan). 2. ‘Community Policing’ In The Netherlands: Four Generations Of Redefinition (Maurice Punch, Bob Hoogenboom and Kees Van Der Vijver). 3. A Critical Appraisal of Support for Community Policing in France (Christian Mouhanna). 4. The Development of Community Policing In England: Networks, Knowledge and Neighbourhoods (Nick Tilley). 5. Community Policing in Contested Settings: The Patten Report and Police Reform in Northern Ireland (Aogan Mulcahy). 6. In Search of a Process: Community Policing in Australia (Jenny Fleming and Juani O’Reilly). 7. Current Developments Affecting The Japanese "Koban" System Of Community Policing (Noriaki Kawamura and Yasuhiro Shirakawa). 8. Japanese Community Policing Under The Microscope (Tom Ellis, Chris Lewis, Koichi Hamai and Tom Williamson). PART 2: KNOWLEDGE-BASED POLICING: FUTURE DIRECTIONS. Introduction to Part 2 (Tom Williamson). 9. Knowledge management challenges in the development of intelligence-led policing (Jerry Ratcliffe). 10. A Cross cultural Comparison of Intelligence Led Policing (Fredric Lemieux). 11. Reassurance Policing, Community Intelligence And The Co-Production Of Neighbourhood Order (Martin Innes and Colin Roberts). 12. Generating Youth Safety From Below: Situating Young People at the Centre of Knowledge-Based Policing (Monique Marks and Jennifer Wood). 13. Identifying the communities in Community Policing: A Geodemographic Example of Knowledge Based Policing (David Ashby). 14. Going Beyond Community Policing to Predictive Analysis (Nick Ross and Ken Pease). 15. Rethinking Governance: Conceptualising Networks And Their Implications For New Mechanisms Of Governance Based On Reciprocity (Karen Stephenson). 16. Prioritising Crime Problems In Belgium According To Strategic Police Planning: Developing the National Police Security Picture for Belgium By Means Of A Multi-Criteria Decision-Making Model (Martine Pattyn and Paul Wouters). PART 3: ENGAGING COMMUNITIES AND REGULATING PARTNERSHIPS. Introduction to Part 3 (Tom Williamson and Les Johnston). 17. Neighbourhood Policing And Community Engagement: Police Community Support Officers In The London Metropolitan Police (Les Johnston). 18. Integrated Security: Assembling Knowledges and Capacities (Julie Berg and Clifford Shearing). Conclusion to the Handbook (Tom Williamson).